What happens to all of the Olympic hardware once the last medal is awarded and the torch is extinguished? It depends on the Olympian—but a surprising number of medals find homes in sock and underwear drawers. Here are 12 winners who made a different choice. Nine-time gold medalist in track and field for the U.S.
At his father’s funeral in 1987, Lewis left the medal he won for the 100-meter in the casket with his dad. When his mother seemed shocked, Lewis told her that it was no big deal; he planned to get another one. He was right. 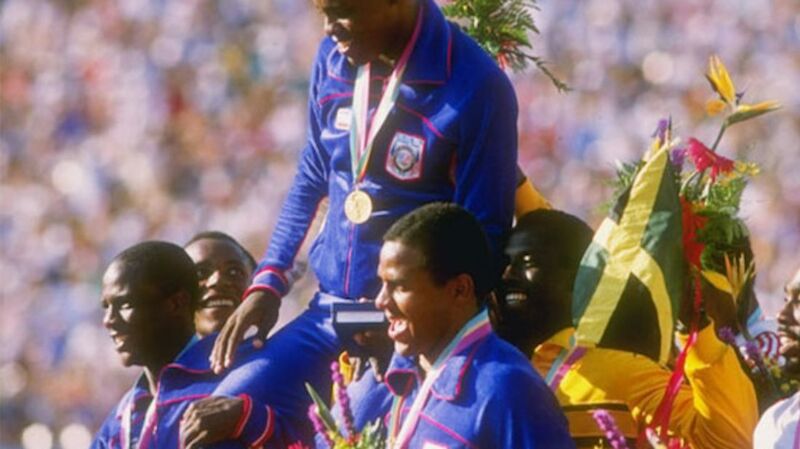 At the Seoul Games in 1988, Lewis originally got the silver in the 100-meter but later claimed gold when Canadian Ben Johnson lost the medal for steroid use. Rampone (left) keeps her medals in a rather unorthodox place: in her pots and pans in the kitchen. “I figure, who’s going to look in the kitchen?” she said. She may move them now that the world knows her secret hiding place. Back when she just had a couple of medals, Rhode liked to tote the hardware around with her. “A lot of times they’re with me or in my back pocket as I used to carry them when I was younger,” she said. Once you start racking up the medals, it gets slightly more challenging to display them. That wasn't a problem for Bonnie Blair, who had a coffee table custom-made in the shape of the Olympic rings to showcase them. "A very good friend made it for me. It's got a glass top. It's one of the most unique pieces of furniture I can imagine, and I can share it with anybody that comes to the house. It's very cool. It's something that I'm very proud of." “Actually I looked the other day and the medal was in my nail drawer, with all my nail colors and everything,” Jenner recently told H&M. Ryan Suter took his father's hardware to show-and-tell at school every year—and it didn't always make it home. Sometimes it sat in his locker for weeks before making it back to the Olympian. "I didn't realize how special it was," Ryan said. Someday, Ryan can send his own medal to school with his kids—he won a silver with the U.S. hockey team at the 2010 Olympics in Vancouver. Ian Thorpe made waves at the 2000 Olympics in Sydney when he dominated the medal stand at just 17 years old. He left them in a bank vault—and didn't look at them for a decade, when he had a photo shoot to mark the 10-year anniversary of his achievements in Sydney.